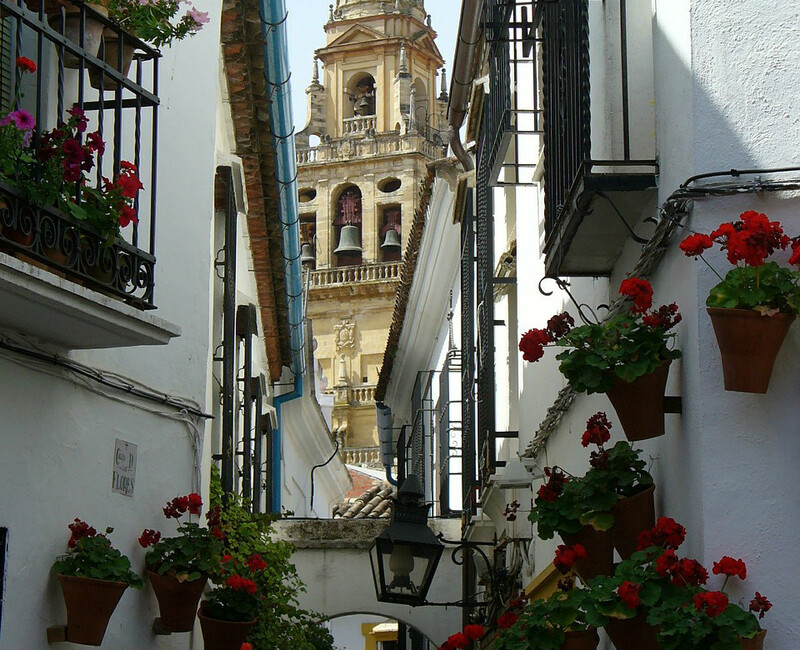 Thinking about a cultural route of Cordoba is no simple task. Come with us and discover why! Take a look at the cultural route of Cordoba, and start dreaming about getting lost in its matchless streets and feeling the atmosphere of this millennial city. This Andalusian city owns the biggest historical city centre of Europe, as well as the largest urban area declared World Heritage Site by the UNESCO. The vast quantity of monuments, statues, buildings and the pacific coexistence of Christianism, Islam, and Judaism all along its history has made this city a real jewel not only in Andalucia but in whole Spain, too. One last thing you should know before getting started. As ancient Roman walls surround the city, you have to pass through one of its doors to reach the city centre. The most famous ones are the Puerta de Almódovar, Puerta de Sevilla and Puerta del Puente, this last one being the one chosen by us to begin this cultural route of Cordoba. The Torre de la Calahorra , in the south bank of the river Guadalquivir, is the starting point of this cultural route of Cordoba. Situated at the end of Puente Romano, it used to be the control access to the city during the Islamic kingdom. 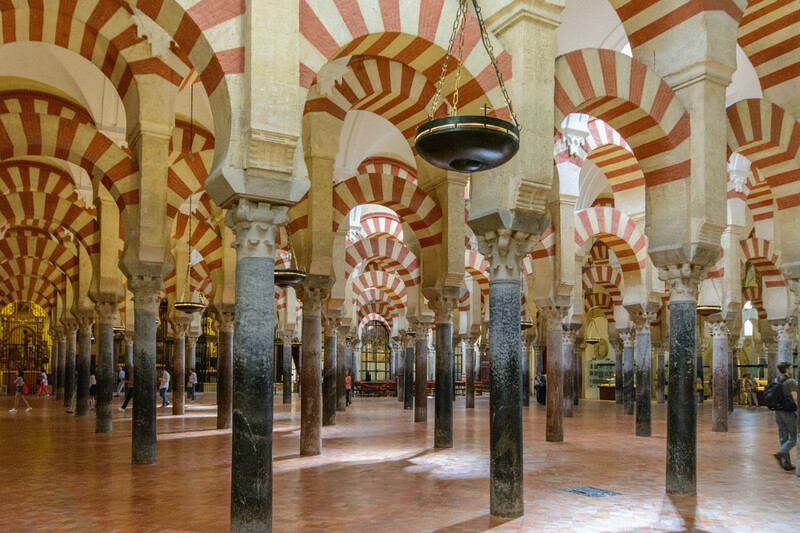 Make sure to stop by, as nowadays it hosts the Museo Vivo de Al-Andalus, where you can discover the pacific coexistence of the three religions and cultures of Cordoba. As mentioned afore, this tower is located at the beginning of the Puente Romano , which connects the neighbourhood of Campo de la Verdad with the Cathedral. The I-century bridge is said to be part of the Roman Vía Augusta, that connected Rome with Cadiz. A curiosity: this bridge is part of the small Nature Reserve of Sotos de la Albolafia, a two-hectare reserve home to various threatened bird species. The view you can enjoy from Puente Romano is one of the most famous of Andalucia, as well as Spain’s. In fact, it is from here that you can devise the magnificent Mosque of Cordoba, which is the next stage of our route. The Mezquita – Catedral was declared World Heritage Site in 1984, and as you approach it, you will know why. It symbolises the pacific cohabitation of the three most important religions, and that is why it is called Mosque – Cathedral. It was built on a part of the Visigoth church of Saint Vincent by the caliph Abd ar-Rahaman I, while the other part of the Cathedral can still be seen nowadays. Impressively, the Arabic style of the structure of the Mosque gets along deliciously with the Gothic, Renaissance and Baroque style of the Christian architecture, giving birth to an authentic architectural jewel. After you have been left breathless by that magnificent view, move to the West side of Cordoba, towards the Alcázar de los Reyes Cristianos . This 1328 palace was built by the king Alfonso XI on the remains of Roman and Arabic structures, and it served as the see of Inquisition during the late Middle Ages and the beginning of the Renaissance. Here, you can’t miss visiting the marvellous gardens and patios of Mudejar inspiration, among which, the Jardines del Alcázar stand out. These 55000 m2 terraced gardens are full of orange trees, colourful flowers, fountains and fish ponds that are to make you want to get lost here and to never be found. Also, make sure to take a stroll along the Paseo de los Reyes, a short walk surrounded by cypresses and divided by narrowed ponds. Right next to the Alcázar, you will find the Caballerizas Reales , built by Philip II in 1570 to rear the excelling Spanish horse breed, known as the Andalusian horse. These magnificent animals are still bred nowadays, making Andalucia famous in the whole world. Both the Alcázar and the Caballerizas Reales are enclosed by four towers, which give a sober aspect to the building from the outside. Proceeding to the North of the city, you will come across the Judería , the Jewish neighbourhood of Cordoba. Here you must visit the only Synagogue of Andalucia and the third best preserved of all Spain. You may also want to enter the Casa de Sefarad, where you will find out the Sephardic-Judaic tradition of Spain, together with a section dedicated to the women intellectuals of Al-Andalus. Lastly, take a walk in the Calleja de las Flores, a narrowed little street whose facades are coloured by plenty of flowers, and from whose square you can devise one of the most magnificent views of the Cathedral. After finishing enjoying the beauties of the Judería, move towards East, along calle Encarnación. You will soon see the Archaeological and Ethnological Museum . Here, a collection of more than 33500 pieces from the Prehistory to the Middle Age is displayed on the remains of an ancient Roman Theatre. 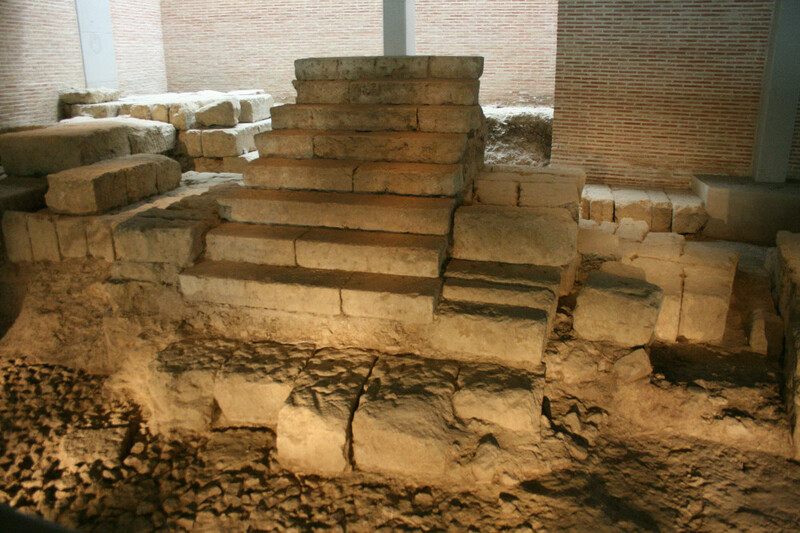 You can still see the leavings of Hispania’s biggest theatre in the basement of the Museum, as well as those of the Palace of the Páez de Castillejo. Afterwards, follow calle San Fernando, and reach the I century Roman Temple of Cordoba , the most important of Andalucia and the only one discovered through archaeological excavations. As soon as you end this jump in the past, walk along calle Rodriguez Marín, which will take you to Plaza de la Corredera . 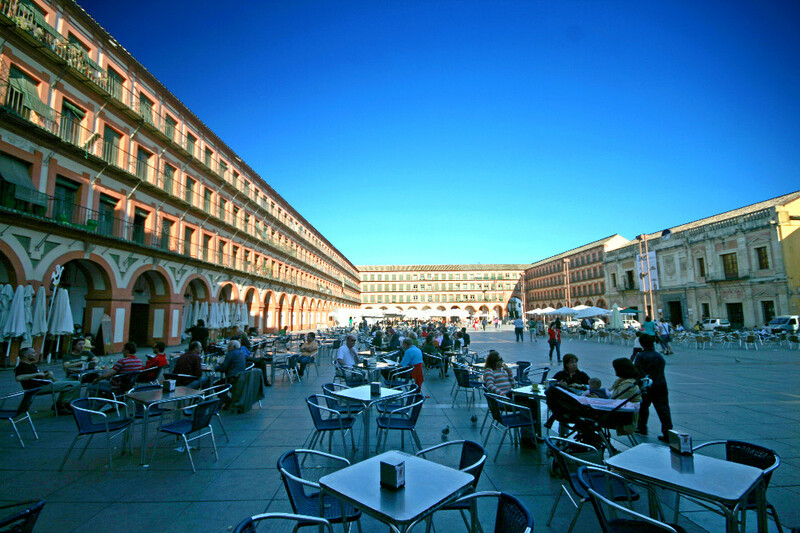 This square is also known as the Leisure Square of Cordoba since it has been used for public entertainment for ages. After being utilised as an amphitheatre, it was the see to horse races, bullfights, and Inquisition burnings. 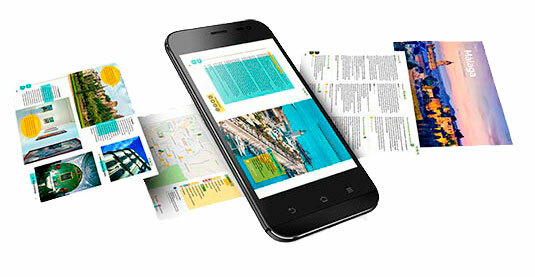 Nowadays, you can relax and tapear in one of its numerous bars and restaurants. Lastly, reach Plaza del Potro through calle Sánchez Peña and calle Armas. This square owes its name to the figure of a foal situated in its main fountain. This area is famous for the neighbourhood of La Posada, which was described by Miguel de Cervantes in its masterpiece “Don Quixote de la Mancha”. These days, it welcomes the Museum of Fine Arts, the city art museum where Cordoban masters’ masterpieces are displayed. When should I go for a cultural route of Cordoba? Cordoba is a beautiful city to visit all year long. However, it is in May that it acquires a special charm. The first two weeks of this month are dedicated to the Festival of the Patios, while during the last week, you can enjoy the joyful atmosphere of the May fair. In 2019, the Fair dedicated to Our Lady of Health is taking place from the 25th of May to the 1st of June in the Arenal area , where you will be able to dance Flamenco, and drink and eat Cordovan specialities. In order to relax after the cultural route of Cordoba and before the fun times of the May fair, you will need a place to stay. We have thought about it too, and we are providing you with a selection of the best holiday homes in Cordoba and its province. This will sure make your stay even more pleasurable, if possible! 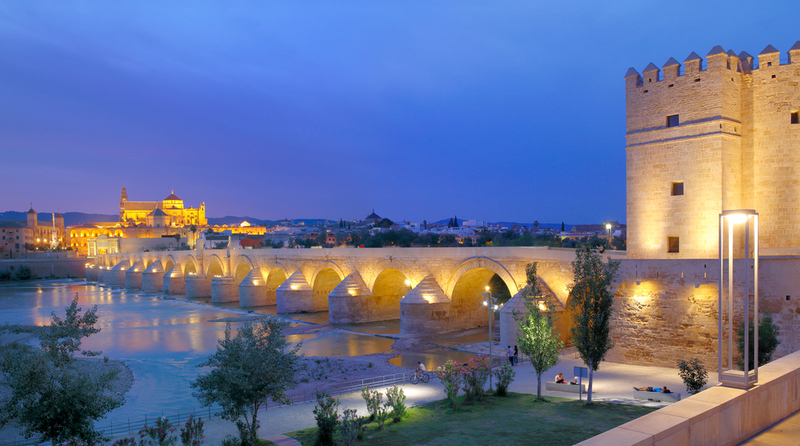 The cultural route of Cordoba is just one of the possible routes you can do while in this magnificent city. Stay tuned for there are more to come! Did you like the cultural route of Cordoba? 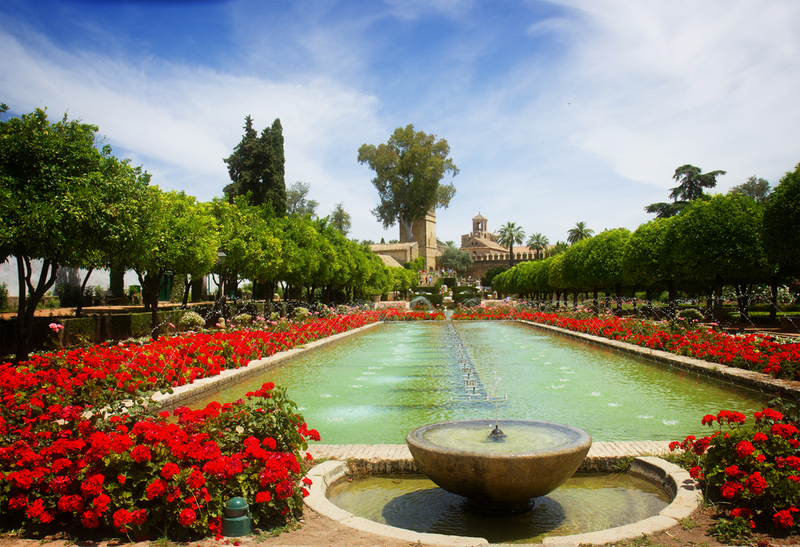 Have you been in Cordoba during May and visited any of these places? Tell us in the comments; we want to know more! Hello, yeah this post is genuinely pleasant and I have learned lot of things from it concerning Cordoba and the most important monuments I must see when I travel to Andalusia. thanks. Thank you Marcia! Which monuments do you want to visit when in Cordoba?